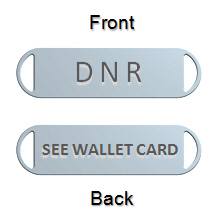 DNR D- Style Stainless Steel ID Bracelet. DNR D- Style Stainless Steel ID Bracelet. 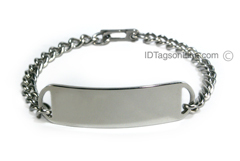 DNR D- Style Stainless Steel ID Bracelet. Medical ID Bracelet, DNRIDB03 (size 1-3/4" x 1/2"), is made from non allergic Stainless Steel and is hand polished to the mirror finish. It is featured regular (3/16" or 5 mm) curb chain with sister hook or lobster clasp. Please choose correct length of the chain. If you are not sure about right length, please refer to suggested document: "How to choose appropriate length of the Medical ID Bracelet"
Please be advised that no Black Ink is used.